We live in a world of technology where a vast majority of devices require an internet connection. At any given time, one household may require a single internet connection to be able to support a large number of devices. This can be anything from mobile phones to Smart TVs to laptops. 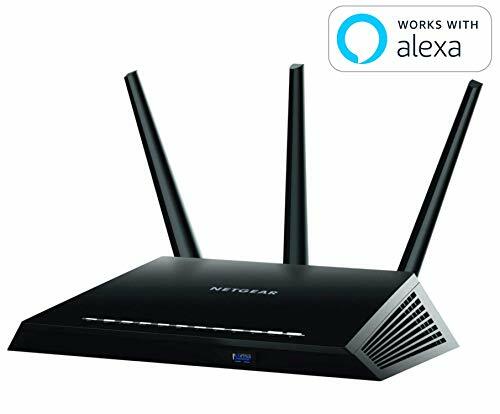 If you want an internet connection that is equally spread across a greater distance then the NETGEAR AC3200 is key. The numerous features on this wireless router all work in harmony to make sure that you get high speed internet access no matter where you are in your home. One such component is the six separate high powered antennae and amplifier, making sure that the signal is broadcast clearly. The strength is maintained with the help of the Beamforming+ feature. Another one of the benefits of the NETGEAR router is that it is intelligent in managing the signals sent to various devices. It carefully sorts to through the ones that are deemed to be slower and faster and puts them on a particular radio respectively. This way, you will never have to lose speed due to too many devices being placed on a single channel. The router also offers one of the fastest speeds on the market. 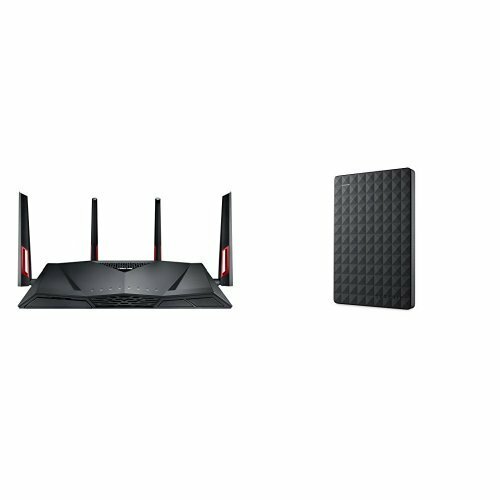 It is true that this wireless router is significantly more expensive than some of its counterparts on this list. When you consider what it can do however, it may be worth the investment. Protection with Trend Micro with triple-strength total network security, plus robust parental controls and privacy protection. 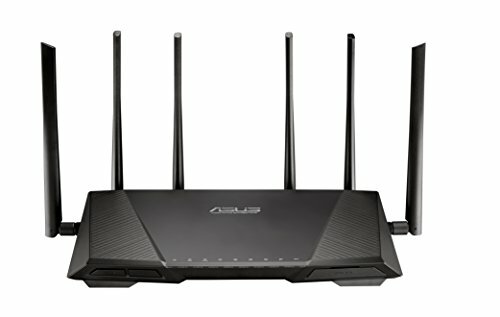 This ASUS wireless router works as sleekly as it looks. It is definitely something that you want in your home if you are looking for a great deal of power. The 1024-QAM technology means that you can look forward to combined speeds of up to 3167 Mbps of throughput. If you are an avid gamer, you will be able to particularly appreciate the WTFast Game Accelerator. With this, you will be able to improve the speed at which you conduct your online gaming. Due to Smart Connect, you also get customized options, depending on the devices that are present. This means that the router is capable of determining the ideal requirements and capacities for each of the connected devices. As such, each will work to best of its capabilities. Of course, there is little use to having all of this if you cannot protect your network. Well, thanks to AiProtection, You will have parental control, automatic vulnerability detection, and the blocking of malicious websites. You should be warned, nonetheless, that all of this will not be cheap and you will have to part with about three hundred dollars. 33% greater 2.4 GHz coverage with 4 transmits, 4 receives (4T4R) antenna design, able to reach our widest-ever coverage up to 5000 SQFT. Expansive Connectivity Options: with exclusively has 8 x Gigabit LAN ports for up to eight Ethernet-compatible devices to connect simultaneously. Powerful 1.4 GHz dual-core processor, Faster USB data transfers enjoy up to over 100 MB/s speed and the router download/upload speed (WAN-LAN throughput) up to 1.8 Gbps. If you are hoping that the D-Link DIR-890L is as hi-tech as it looks then you will certainly not be disappointed. It has a 1 GHz dual core processor which helps you to utilize faster speeds. The better speeds opens up so many possibilities for your home including faster gaming and 4K resolution videos. The Tri-Band capabilities of this router also means that you will be able to connect with a larger number of devices. You have both two 5GHz and one 2.4GHz. This router is also another device that makes use of the Smart Connect feature. With this, you will be able to ensure that devices that really need that added speed will be able to get it. You will not have to worry about any unnecessary utility of the internet connection by slow or outdated devices. Regardless of how much power you need from your wireless router, the DIR-890L will be able to deliver. If you want a wireless router that boasts power but don’t want to pay for the privilege, the NETGEAR AC1900 will serve you well. In addition to being an upgrade from previous NETGEAR models, the AC1900 also has the distinction of being one of the best routers on the market. It provides all of the services a busy home might need but at a competitive price. The AC1900 is powered by a dual core processor that runs at 1GHz which is more than you need for your home. With the compatible app, you will also be able to remotely access the router. This NETGEAR model is a little bulkier than some of the other options out there. Nonetheless, for all of its features and benefits, its size barely makes a dent as a negative. One such component is the six separate high powered antennae and amplifier, making sure that the signal is broadcast clearly. The strength is maintained with the help of the Beamforming+ feature. Another one of the benefits of the NETGEAR router is that it is intelligent in managing the signals sent to various devices. It carefully sorts to through the ones that are deemed to be slower and faster and puts them on a particular radio respectively. This way, you will never have to lose speed due to too many devices being placed on a single channel. Conclusion: If you are looking for some serious bang for your buck, this list will be able to fulfill your wish. All of the wireless routers on this list will be more than capable of providing an uninterrupted and strong internet connection throughout your home.